Ceiling fans that make noise can be downright maddening. Ceiling fans are intended to add comfort to your home, not provide annoyance. The sounds that ceiling fans make vary and indicate what the problem is. The following article will help you identify some quick-fixes depending on the type of noise you fan is making. Some people like to test the ceiling fan motor before it is installed. If you are doing this without the blades attached, the fan motor is sure to make noise. All fans will make noise without the blades installed and it’s really best to attach the ceiling fan blades before operation. Is Your Ceiling Fan Making a Humming Noise? This commonly happens when using dimmers. Dimmer wall controls are made to control lights and may cause your fan to hum. We DO NOT recommend the use of dimmers to control fan speed. You should remove the dimmer switch and replace it with a standard speed control. Another possibility is that you have a bad receiver. If you are using a remote control, remove the receiver and connect the fan directly to power. If the noise goes away, your issue is a bad receiver. Your ceiling fan might have bad capacitors. Try changing the switch cup and/or capacitors. If the fan is also running slowly, the voltage level that the fan is receiving may be low, causing the motor to struggle. Voltage levels below 105 volts A/C will cause noise. If you have multiple fans on the same controller or same circuit, this could be the noise culprit. Fans used in tandem with other fans on a wall controller tend to be more prone to noise. Especially in older homes, many rooms are on the same branch circuits. This can cause a low voltage to be present which will cause a fan to make noise and run slowly. Make sure that the screws securing the ceiling fan blades to the motor aren’t loose. Tighten them up if needed. Also look to see if there are any loose screws inside the motor housing. These should be snug, but not overly-tightened. The problem could also be wire connectors inside the switch housing. Check to make sure the wire connectors in the switch housing are not rattling against each other or against the interior wall of the switch housing. TURN THE MAIN POWER OFF BEFORE CHECKING THIS! If the noise is a sizzling sound and there is an odour is present, the drive capacitor is bad. Replace it as soon as possible. If it’s a grinding your hearing, most likely the ball bearings in the motor are bad. 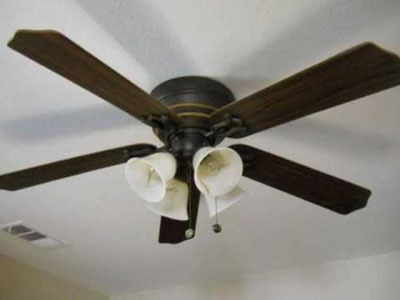 Some ceiling fans have flywheels that attach the blades to the motor. If the flywheel is sagging or has broken, the blade irons might be scraping on the top of the switch cup housing. This noise could be a loose mesh on the upper or lower housing that covers the vents. Tighten all screws in the fan to fix. Is the the junction box is securely mounted to the ceiling? Make sure that nothing (wire nuts, wires, screws, etc.) is hitting the motor as it spins. If you have high gloss blades on your fan, clicking might indicate that the glossy finish may have cracked. Tighten the screws attaching the blades to the blade irons. If this doesn’t work, try using some felt washers to absorb the space left from the cracked paint. Creaking can typically be traced to the blades and usually varies with speed. Tighten or replace the blades. If the noise is intermittent its possibly due to loose screws. Check all screws and make sure the mounting bracket is tightly mounted to the junction box. Rubbing sounds are probably from the lower motor housing. If you have an older fan, the flywheel (a circular piece that attaches the blade irons to the motor) could be sagging or broken and the blade irons are rubbing against the housing as the fan turns. If it’s a new fan, check for bent housing or shipping damage. Check your fan blade irons to see if they are sagging and scraping the top of the switch cap housing.